Cakes play a big role in many celebrations, so it's not surprising that scrapbookers often search for ways to incorporate cake theme layouts into their scrapbook albums. Fortunately, this is not difficult to do with some fun supplies and a little creativity. Bring on the Cake: Snap a picture of the guest of honor standing next to the cake or blowing out birthday candles to use on this scrapbook page. Accent with lots of cake stickers. Let Them Eat Cake: Use this page title for a silly scrapbook layout featuring party guests enjoying cake. Make a border using patterned paper with a cake design for added fun. Have Your Cake and Eat it Too! : If you're on a diet, use this title to add journaling to discuss how good it feels to treat yourself occasionally to a delicious piece of cake. Have Your Cake and Wear It Too! : If you have wedding pictures of a bride and groom feeding each other cake, this is the perfect page title to use! This saying would also be appropriate for a Baby's First Birthday scrapbook page since baby usually ends up "wearing" much of his cake. Consider including "before and after" photos, one with the bride and groom (or baby) in front of the undamaged cake, and the other complete with smears and smiles. I'm Here for the Cake: Use this page title to document the process of choosing a cake for a wedding or other special occasion. Get pictures of your favorite bakery and some of the cakes you considered, with the winning design featured in the center. Add stickers or cutouts of forks and knives to embellish your page. A Party Without Cake Is Just a Meeting: This saying would be perfect for a scrapbook page about a work-related social function. Discuss how you enjoy spending time with your coworkers in a social context and don't forget to feature a photo of the cake that you all enjoyed at the event. You could also include images of your coworkers, each enjoying their own serving of cake. Birthdays Are Nature's Way of Telling Us to Eat More Cake: This is a fun choice for an adult birthday page, since celebrations for adults tend to revolve more around the food and drink than the exchange of gifts. 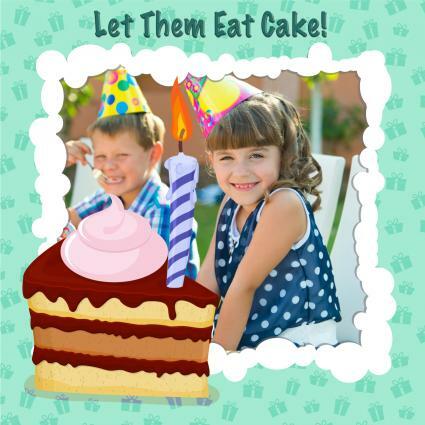 Embellish with images of candles in the birthday boy or girl's age as well as cake stickers in a variety of colors and styles. Cake Boss: If you enjoy baking, this TV-show inspired page title is great for a page that shows off some of your favorite cake creations. This layout will need lots of images along with descriptions of the cakes and the events they were made for. Keep Calm and Bake Cakes: "Keep Calm" sayings are everywhere, but this one works especially well for a scrapbook page about your cake baking process. Don't forget to include a few of your favorite recipes in an envelope or mini scrapbook attached to the page. Kawaii Cupcakes Digital Paper Pack: Etsy Seller Dreaming on a Star has an adorable patterned paper kit for digital scrapbooking that includes 13 coordinating designs. The pink and purple color scheme would make this perfect for girls' scrapbook pages. Homemade Cake Paper: This patterned paper sheet from Carta Bella is an easy way to reinforce the theme of your scrapbook page. It coordinates with products in her Home Sweet Home Collection. 3D Scrapbook Sticker: 3D stickers are an excellent choice for when you want to quickly add a handmade touch to your scrapbook page. This pack features a three-tiered cake for your sweetest wedding cake page ever. Birthday Cake and Gifts Scrapbook Paper: Activity Village has adorable blue patterned paper with a birthday cake and present design. Cake Border: This stationery border could easily be adapted for use as part of your scrapbook layout. KR Birthday Cake! Dings Font: This free dingbat font features cakes with different numbers on them, as well as a few general cake images. You could also try incorporating elements from the cake topper into your layout to embellish your scrapbook page without spending a lot of money. Glue dots work well for adhering most plastic cake decorations. 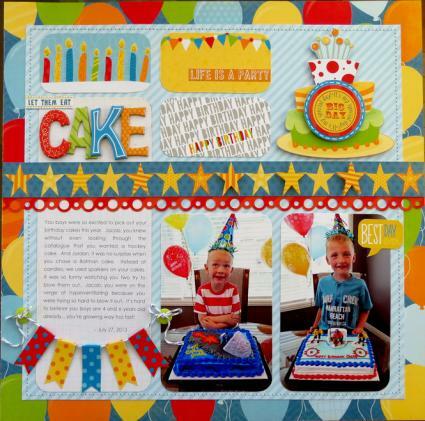 Cake themed scrapbook pages are fun and festive, which makes them the perfect addition to any scrapbook album. Whether you reinforce your theme with a few cake stickers or arrange your photos in the shape of a giant cake, this page is sure to be one you'll cherish for many years to come.